Many years ago, my initial quest on the web in 1995 wasn’t to create restaurant style recipes, it was to archive family recipes. All of the women in my family cooked, we were all from your average family who couldn’t afford to go out to eat every night, but we did enjoy making delicious food for those that we love. 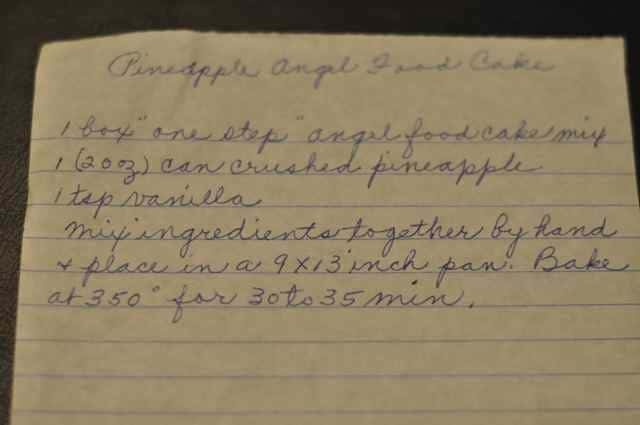 This recipe for my Grandmother Ethel’s Pineapple Angel Food Cake has been around for a long time, and I am quite certain it wasn’t her recipe to start with, but let me show you how something becomes a recipe online. I still have about a shoebox full of these lovely handwritten recipes. I would recognize this penmanship anywhere. It is my Grandmother, Ethel Eynard, my Dad’s mom. She inspired me to collect recipes, and cook books. I would go over to her house, and be filled in awe with her large collection of cookbooks. She must have had about 20. More interesting to me, was that she really didn’t need a recipe to cook with, her food was simple, but often sublime. She would write out recipes for me and send them to me. Whenever I would go over to her house, she would make a new recipe. At one point this recipe was new. This recipe was one that she most likely made for my Dad and me. My Dad was diabetic, type I, he had to take several insulin shots a day. When I was growing up these baked good weren’t something we had too often,because we tried to respect that my Dad couldn’t enjoy them. This particular angel food cake is lower in sugar, and was a treat we could enjoy. Whenever I look at these recipes, memories come flooding back to me. A dessert like this was enjoyed after dinner, and after a couple of games of cards. I can remember sitting in her kitchen, enjoying a piece of cake while bantering back and forth about who was winning, and who was losing a game of rummy. These memories are all the more touching now, because everyone that sat at that table with the exception of me is gone now. I now have the memories, and the piece of paper that my grandmother so carefully wrote out her recipe. While so often I can’t convey to you the special meaning something that this recipe has to me, I hope I can offer you a good recipe in which you share, and enjoy a pleasant evening with those that you love. Please note, there is no water or anything else added to this recipe other than the ingredients listed below. Here is my Grandmother during a camping trip. I am guessing we were up in the mountains and enjoying a meal. Do you have special family recipes that mean something to you? Do you equate recipes with memories? Pineapple Angel Food Cake is a delicious low fat cake. Preheat oven to 350 degrees. In a medium sized bowl mix together the angel food cake mix and can of crushed pineapple including the juice in the can by hand and place into a greased 9 x 13 inch pan. Bake for 30 to 35 minutes. Really enjoyed this recipe ??? Do you add the water, as per the box angel food cake recipe? Or just the dry mix and pineapple? Just do the dry mix and the pineapple. This tastes soooooo good. Were it not for the fact that my daughter open and slammed the oven door not realizing there was a cake inside, it probably would have been perfect. As it was, it came out a bit dense, but … the *flavor*… Wow! Thanks for this easy cheezy recipe! I will be making it again, hopefully without any looky loos. This cake is delicious – it is sweet but not syrupy with a light and spongy texture. The recipe is wonderfully simple, foolproof really. I mixed the 3 ingredients together roughly by hand, then added a little yellow food coloring and mixed again. I poured it into a glass pan that was coated in veg oil cooking spray. Cooked it for 30 mins then let it cool in the pan. I frosted it with butter cream (butter, powdered sugar, milk) that had reduced light coconut milk sub’d for the regular milk and the addition of coconut flakes. Thanks for sharing! Do you grease and flour the 9 x 13 pan? andma, her cooking and her kitchen! Oh…Wow!!! What a great picture of your grandmother and my aunt. I was surfing your site and always click on the family recipes and you are so right….Aunt Ethel’s penmanship was beautiful. Cursive will become a lost art in the very near future. I know you treasure those hand written recipes as I do my mom’s. I am trying to figure out why ElSat’s cake did not turn out. And I am trying to do it before making the cake myself. What I am thinking is that this cake has only three ingredients; perhaps ElSat made the recipe with additional ingredients as per the box of cake mix. Perhaps the vanilla was omitted as the directions do not say to include it. Maybe it was unpalatable because it was a Weight Watcher’s recipe. I have no idea what happened to her cake, I have made this cake many times without fail. It could have been an old cake mix, it could have been using pineapple with syrup instead of the water packed version. Does it matter if the pineapple is in heavy syrup or should you use the kind in “it’s own juice”? Use the pineapple packed in its own juice, do not use the kind packed in syrup. Made this recipe and it turned out terrible! Had to throw it out! Instructions were too vague and when I saw the original handwritten version and then the printed version i wondered if the “one step” cake mix made the difference and if it did, what was it? This recipe typically turns out very well. I don’t know what happened to your cake. The one step boxed cake mix, just meant a box of angel food cake mix. I am very sorry the cake you made was horrible and you had to throw it out. It has to be a one step mix. There are some packages that have 2 pouches. The 2 pouch variety will turn out gummy and flat. Could you give me texture of this cake? Is it moist & chewy or more like just ordinary cake? I plan to make it very soon but just wondered more about it. Thanks so much for all of your recipes. I have copied tons of them. It is a very light cake, it is kind of chunky inside because of the crushed pineapple. what a precious memory. Thanks for sharing it with us. I have almost all of my mothers recipes also, many of them in her hand writing. We’re Polish, so you know cooking runs through our blood. I love those hand written recipes. This is also a Weight Watchers recipe. It is soooooooooooooo fabulus. Sounds like a great recipe – will be sure to try it…. Does the crushed pineapple need to be drained? You dont need don’t to drain the pineapple. Stephanie, again you have prompted a response from me. I usually am a ghost reader. I have recipes written by four different hands. My mother, two grandmothers and me. I will keep them because they are hand written. The ones by me I keep because they remind me how I came by them. I had left home under bad circumstances and would call my mother from work during my lunch break. “Hey, I’ve thawed out ______, what do I do with it?” And she would give me basic cooking instructions. I still have those scribbled notes. I also have over 80 cookbooks and an extensive folder of recipes I have gleaned from usenet in the 80s and 90s and then from websites. And yes, Stephanie, some of those recipes are yours. Your website is one that I have been reading for years, and I love it. Wow, thanks so much 😉 I really think it is the special recipes that we hold the most dear. I can always buy another cookbook, I can’t replace my grandmother’s recipes. Be sure to identify each recipe by where in the family tree it falls. Provenance for the following generations. and check with an expert for storing your precious treasures. Thanks, your so lucky to have such nice memories! This brought back memories of the same. 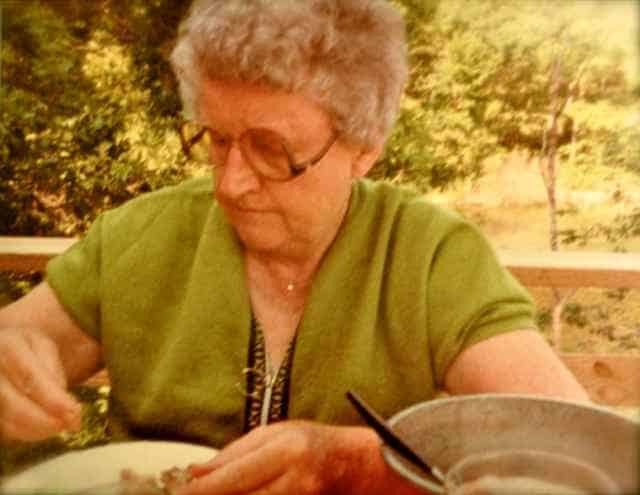 I ran across scribbled recipes of old southern desserts and side dishes my grandmother had written. One you rarely hear of is “Lane Cake”. Fifteen years ago at a big family reunion combining many sides of the family, a favorite recipe was asked from each person. This was put into a book for all to each receive at the party. Sadly, that was the last reunion due to many passings, but I use that book almost everyday and remember the meals and the person. I’ve already made a cookbook of my own recipes for my kids to remember with stories behind each recipe. Vicky that is a wonderful thing you are doing with the putting the stories behind he recipes!